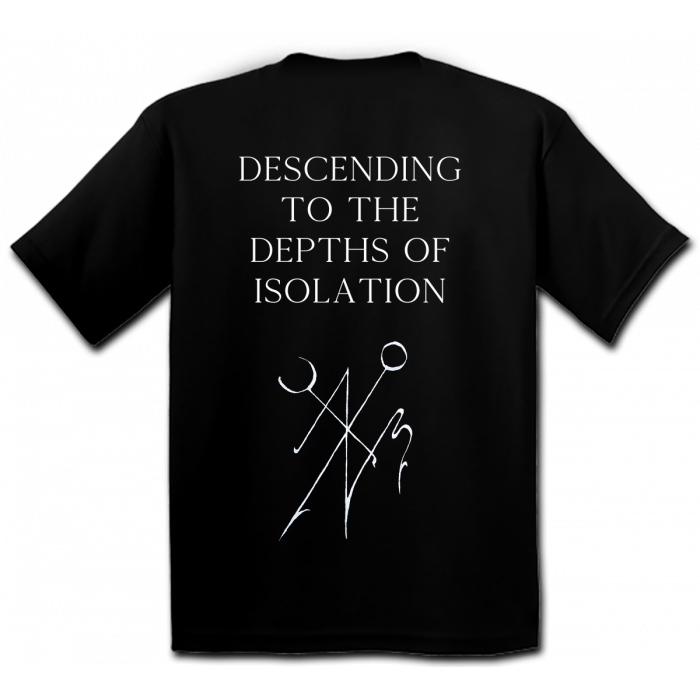 Arthedain "Isolation" Shirt now available through Naturmacht Productions! Written over a period of three years, “Infernal Cadence of the Desolate” builds upon the concepts Arthedain introduced with their previous release “Arias Exalted” and explores the journey of one’s slow descent into the fringes of madness and eventual return to lucidity. Musically, there are soaring melodic passages which bridge the gap between the mid-paced, atmospheric sections and the chaotic, intense barrages of aggression that drag the listener along at a frantic pace. The music spans a variety of influences including traditional black metal, melodic death metal, and post black metal while adding some influences that, while remaining organic, will likely surprise listeners upon first reception. The lyrical themes include reflections on the depravity of war and its aftermath on one’s psyche as experienced by vocalist Charles Wolford, and the struggle to come to terms with the cause and effect relationship of individual actions while pursuing the end goal of optimism and composure. In addition to these topics, there are also allusions to Goffman’s idea of dramaturgical analysis and a critique of the value of existence as based on writings by Schopenhauer. The album has seen the band expand as a whole, including the addition of new guitarist Nicholas Colvin and session drummer Ilya Tabachnik who provide intriguing musical contributions to Arthedain. Listeners can expect a challenging experience which takes them through bleak, harsh territory before reaching a gratified conclusion. The album should be heard in full in order to experience the entire concept. Size: 15cm x 10cmSetting: Woven, silverish grey on black.. Written over a period of three years, “Infernal Cadence of the Desolate” builds upon the concepts Ar..
5,5cm x 3,5cm Metal Pin. Limited to 50 pieces.. Brand: Gildan Heavy CottonPrint: two sided, one colourLimitation: 50Artwork: Luciana Nedelea Artwork.. VOLUNTARY LABEL DONATION - No must! Many thanks!